What does it mean to be a raw vegan? We’ve wondered that ourselves many times. So who better to explain the concept than someone who lives by the lifestyle herself? Enter Angelica Xavier, founder of GoodBites, a beloved raw vegan snack company carried at Whole Foods and health food stores alike. What does a raw vegan eat for breakfast? Dessert? We got all those answers and more. Keep scrolling to read, in Xavier’s own words, what a day in the life is like! Because I'm a raw vegan and founded a raw snack company, people often ask me if I like to eat, and my answer is YES! Yes, I like to eat. Super-yummy, innovative food—and a lot of it! A raw vegan diet is more diverse than you might think. Though we don't eat meat, cheese, or eggs, the staple of a raw vegan food plan is nutrient-dense, plant-based food prepared using techniques such as dehydration, heating food under 117°F, and high-impact blending, such as Vitamix, as well as simple, low-impact food prep and combinations. I start every day with a tall glass of water and keep it up all day. Hydration is my first key to feeling good all day! I keep a full on-the-go container and a carafe on my desk. Eight glasses seems like what I drink before I finish my a.m. meditation, which leaves me hungry! For breakfast I enjoy coffee. Yes, I said that! (Ed note: Coffee isn’t technically part of a raw vegan diet.) A cup of joe. It's organic and Swiss Water–process decaf, but I enjoy a tall black cup and not a drop of guilt with it. When you are eating a specialized diet for health and for life, you need to make a couple of allowances. Indulgences allow me to feel better, and I'm able to keep the majority of my day, and diet, in check when I have subtle little pleasures… We will have more of that later in the day! Early in the a.m., I love to eat almond milk chia pudding with fresh berries topped with a little raw granola for a little crunch. It is so filling, satisfying, and full of protein, omega fatty acids, calcium, and dietary fiber. It’s super easy to pop 1/4 cup of chia seeds in 1 cup of almond milk in the fridge overnight, and you are ready for an energy-packed, easy a.m. breakfast. One thing people don't realize about eating raw vegan is that we have a free pass to drink smoothies… every day! Making and enjoying smoothies is fun and delicious, like ice cream. My mid-morning snack is usually a gorgeous green smoothie. Today it's dates, banana, almond milk, kale, avocado, and coconut water. Coconut water is hydrating, and coupled with these action-packed greens, this smoothie is a delicious mid-morning snack. Today, I'm meeting my adviser at Cafe Gratitude for lunch, which is an awesome weekday treat. I love to include my raw vegan lifestyle with the people in my life, and the feedback that I receive is that they benefit as well. The moment we sit down, my adviser says, "I always eat better when I'm with you." PERFECT! He has the macrobiotic bowl with seaweed, kale, Azuki beans, and sweet potato, and I have the raw coconut avocado soup and a side of kimchi sauerkraut. My combination elicits a "Wow, those sound good together" from the waiter. My adviser outs me as a raw food innovator. I do love to find creative combinations for variety and to keep eating curious. We seal it off with a mint tea. Perfect lunch to enable me to fly through a jam-packed inbox this afternoon. My go-to afternoon snack that I reach for are my GoodBites Truffles, of course. 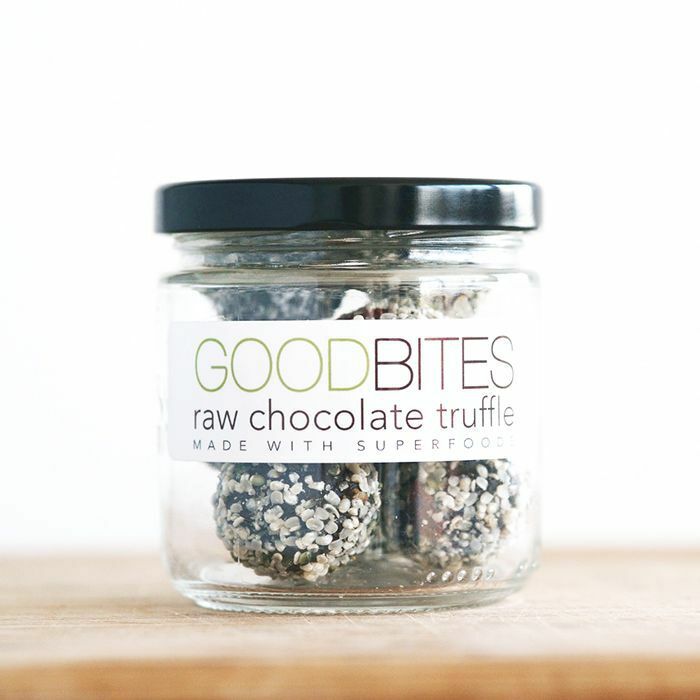 I innovated this nutrient-dense truffle years ago to get through a health slump. They are my go-to for energy and revitalization to make it through the rest of my afternoon task and head off to a late yoga class. I always keep salad staples in my kitchen for last-minute dishes, but in all honesty it is my favorite meal, which I make with mixed lettuces, greens, macadamia or olive oil, a squeeze of lemon, a handful of hemp seeds, dulse seaweed, super-ripe avocado, and GoodBites Cheesy Crackers. Usually on Sundays, I like to prepare a big batch of raw bread and crackers in the dehydrator so I have filling bread-like treats on hand for quick and easy meals all week. After dinner… I need chocolate. Late tonight I’ll have a cup of tea and a couple of snaps of chocolate. We always have an array of my handmade chocolates in the house. They are made with raw cacao, which is rich in manganese, calcium, and magnesium, all of which are great for mood-boosting and stabilizing energy. This is no-guilt, good-for-you snacking. When I first started eating raw 10 years ago (I have been vegan since I was in my teens), the first experimentation I did was with chocolate. I knew that I could eat salads, veggies, and raw snacks all day without feeling I had given anything up, but chocolate I wasn’t sure about. I knew that I needed delicious rich chocolate, so that has become my passion. I keep all the available ingredient options for chocolate-making on hand: maca, cacao nibs, mesquite meal, almond butter, coconut sugar, etc., etc. When I'm inspired and in need of a chocolate fix, that is when the creativity abounds. My chocolate obsession can be brought in check with a word on moderation. If you are thinking of exploring a plant-based diet, I encourage and recommend that you start with a meal and a snack per day. It's easy enough to dedicate one meal and one snack a day that you enjoy solo or with your friends and family, and see where you take it from there. Alternately, if you are raw, vegan, or vegetarian, I support two free-pass meals a week. I leave room to eat whatever I want, off my raw vegan protocol, two meals per week. Of course, there are certain foods that would not come up on my radar, but if you invite me to your birthday party, heck yeah, I'm going to sing happy birthday and have a slice of cake. This allowance gives me the freedom to eat and enjoy dinners out at restaurants and dinners with friends that may not be strictly raw vegan offerings. Keep scrolling to shop Xavier's famous GoodBites Truffles. The whole Byrdie team has taste-tested them, and they're insanely delicious and good for you.